The need for more protection and higher quality lubrication becomes greater during the summer. We previously addressed the issue of summer heat and how it can affect your engine. Today we want to discuss sludge problems and how synthetic oil can help prevent and get rid of them. Sludge is a type of buildup that can occur in your engine due mainly to decomposed motor oil. Sludge isn´t always immediately visible. Sometimes deposits will start forming in areas that are not very apparent. Even if it isn´t visible it can still negatively affect your engine and cause problems. Certain glitches in your vehicle can be signs of a sludge problem. Things such as difficulty starting and engine noises or any type of decline in engine performance can be indicators of sludge problems. If not promptly attended sludge problems can increase and completely wreck the engine. The first step in preventing sludge deposits is using the right motor oil. You need to make sure that you use quality oil that withstands all conditions. Synthetic oil is always the best option for this. 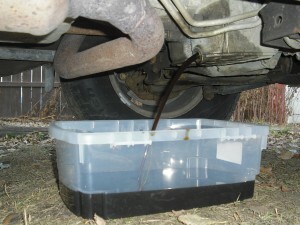 The great thing about synthetic oil is that it doesn´t just help prevent sludge. It also helps remove the sludge deposits that may have already accumulated in your engine. Through its powerful formula and enhanced protection, synthetic oil is able to circulate through the engine. As it does this, it is lubricating and removing the sludge that it encounters. Amsoil synthetic oil delivers the most outstanding results in lubrication, sludge prevention, and protection. Contact us immediately and get your engine clean and strong with Amsoil. No matter what oil you use, changing the oil is also a vital step in minimizing and preventing sludge. All motor oils will at some point need to be changed. The fact that synthetic oil is much more sturdy and durable only means that it can go longer between oil changes but it does need to be changed in a timely manner. Follow your manufacturer´s recommendations in regards to the oil grade that you should use and how often it needs to be changed. Since the engine oil is always circulating to protect the engine, it can face many difficulties. Moisture, dirt, worn out piston rings, heat spots, and all sorts of things can affect or contaminate the oil, over time. Synthetic oil is better adapted and can put up with these sort of factors for longer but it will eventually give in and need to be replaced. Conventional motor oil will easily start to be affected and stop fully protecting much sooner. Take this into consideration and change the oil accordingly and in a timely manner. Engine oil that has traces of water, dirt, or other contaminants is likely to start forming sludge deposits. Especially if the oil filter is not efficiently removing all of it. This, along with the heat and other conditions reacts to create that grimy substance that we identify as sludge. The heat can affect some motor oils more and cause them to thin out. The viscosity is affected and instead of cushioning the grinding of the engine parts it just slips past them. Since the pieces are no longer fully protected against friction they can start to release small metal shavings or particles that are also absorbed by the oil and contaminate it further. Basically running your engine with worn out oil is not doing your engine any good, it is actually damaging it. If your engine is beginning to develop sludge problems you need to start using synthetic oil to immediately treat and stop the buildup. Synthetic oil works efficiently in engines that have accumulated sludge deposits over time. However, if there is an excessive and incredible amount of sludge that has already started to affect the engine, then the engine may benefit from previous treatment in order to truly experience the full benefits of synthetic oil. At Mooresville Synthetic Oil we know that in order to properly care for your engine you need to be well informed. Our goal is to help you make better decisions for the well-being of your vehicle. Stay informed and purchase the products that your engine needs. Call us at (336) 247-0212 today.